Anhinga2 - Anhinga or as some call it the snake bird because of it long neck which can be seen in the water looking like a snake. Anhinga mean devil bird or snake bird in tupi language which is now extinct but was part of Brazil Tupi language in the past. The anhinga is a water bird that spends it time diving for fish and then spear it with it long slender beak. 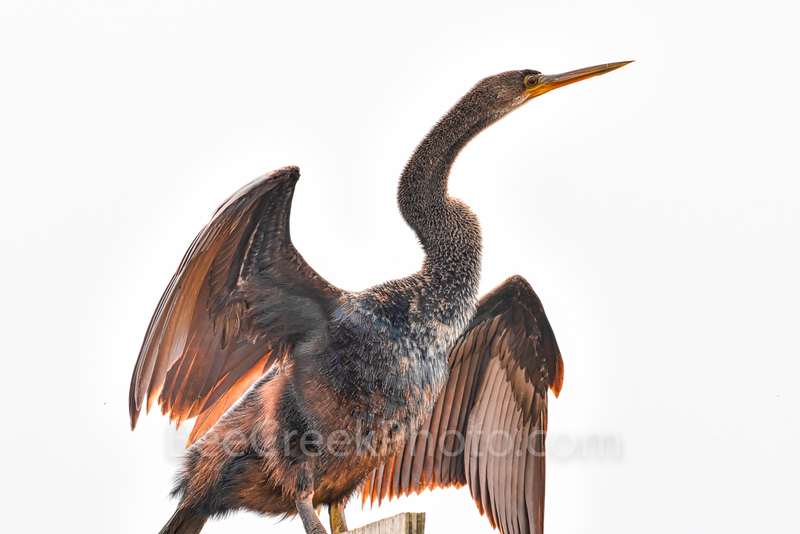 The anhinga can't fly well with wet wings so they spend a good amount of time drying their feathers and you will see them with their wings spread out like in this image to dry along the waters edge. This Anhinga managed to pose for several photos with the white fog background it looked like he was at the studio and had come in for a selfie. Photo © copyright by Bee Creek Photography - Tod Grubbs / Cynthia Hestand.